Fly from Kona to Honolulu to experience a complete tour of Pearl Harbor. If you are staying on the Big Island and want to visit Pearl Harbor, on Oahu, this one-day inter-island tour is the perfect solution. This Kona to Pearl Harbor Memorial Tour includes round-trip airfare, admissions, and transportation on Oahu. Depart Kona on a 40-minute flight to Honolulu International Airport, where a tour guide will greet you and begin your tour. A few minutes later, you will arrive at the Pearl Harbor Visitor Center of the World War II Valor in the Pacific National Monument. The Arizona Memorial portion of your tour includes a 23-minute film about the 1941 Japanese attack, a US Navy-operated shuttle boat to the memorial, and reflection time on board the majestic USS Arizona Memorial. You will then tour the other Pearl Harbor sites, including the Bowfin submarine, Battleship Missouri and the Pacific Aviation Museum. All admissions are included. At the Bowfin submarine, you will go below decks of this amazing WWII submarine and see the cramped conditions that the brave submariners experienced. 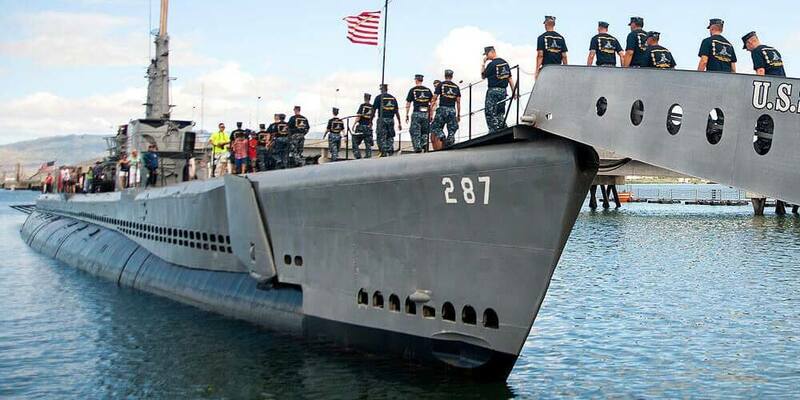 Nicknamed the “Pearl Harbor Avenger,” Bowfin was commissioned on December 7th, 1942 exactly one year after the attack on Pearl Harbor. On the Battleship Missouri, enjoy a guided tour through the ship. See the massive guns, the kamikaze dent, and the site of the Japanese surrender ending World War II. The guided tour of the Pacific Aviation Museum will fascinate you with stories about aviation at Pearl Harbor and throughout the Pacific since then. Here, you can learn about the Ni’ihau incident. For a convenient tour from Kona to Pearl Harbor, this is your best choice. If you bring a bag, which you should not, you will pay a storage fee at Pearl Harbor. Bags cannot be left on tour vehicles. Tour guide gratuity is not included and not required, but encouraged. The name you enter at the time of booking must be exactly as it appears on your valid, government-issued ID. Inter-island air carriers will deny boarding if the passenger name on their ID does not match the name on their voucher. This is a Transportation Security Administration (TSA) and FAA requirement. Air Carriers found to be non-compliant are subject to severe penalties; thus there is no flexibility with this policy. A valid government-issued ID (passport for all non-US citizens) is required on the day of travel. If a passenger is denied boarding, there will be no refund. As you are probably aware, airline flight costs fluctuate often. Occasionally, by the time we receive your reservation, flight prices have increased. If this happens, we will give you the option of cancelling your reservation or paying an “overage fee” to cover the difference in flight prices. Once your reservation is confirmed, you will not be charged extra for flight price overages. Tours that include flights are non-refundable. Due to airline restrictions, passenger name changes are not permitted under any circumstance. Date changes may be possible, but change penalty fees will apply and vary by airline and fare type. Pearl Harbor Oahu is not responsible for and does not extend financial reimbursement for delays caused by factors such as traffic, weather, mechanical issues, or problems concerning Navy-operated shuttle boats. Tour stops such as the Arizona Memorial, Dole, Pali Lookout, and others are not under the control of this website or the tour companies going there. Therefore, we do not guarantee admission or entrance to any sites not in our control. Refunds are not issued if access to any tour stop is denied for any reason. However, we will request a refund or reimbursement for visitors in such cases. When reimbursements and refunds are issued by third party vendors, we always give them to our customers. Punchbowl National Cemetery of the Pacific is closed to commercial tours on Federal Holidays. Tours are unable to enter cemetery on those days. As of May 2, 2011, all passengers traveling to Ford Island (including Pacific Aviation Museum and USS Missouri) must possess valid photo identification. This does not affect the Pearl Harbor Visitor’s Center. Last minute bookings and high traffic dates may have more expensive airfare. If there is a premium cost for airfare on your date we will contact you to collect the additional charge. Took up the whole day, but it was worth seeing. I am visiting Hawaii and most of my family lives on the Big Island, so obviously that’s where we were vacationing. This tour was at a great price and made it easy to escape for the day and see something amazing. Pearl Harbor Memorial is something you should experience. Flew into the Big island for our honeymoon. Stayed in Kona so we could kind of drive around the island to check out some touristy areas. First time in Hawaii and wow is the scenery beautiful and the people are nice! So happy we took this tour to the Pearl Harbor Memorial. It’s something my wife and I really wanted to see with out disturbing our trip to the Big Island too much. It’s definitely worth flying to Oahu to see. Our original goal was to stay on the Big Island, but the more we talked about it, we wanted to make it to Pearl Harbor. The flight one way is about 45 minutes. The memorial itself is reached by a 5-minute boat ride. We had about 15-20 minutes at the memorial itself which felt about right. I was impressed by the quality of the memorial and its proximity to the remains of the Arizona itself which lies in 60 feet of water. Staying in Kona? Take this tour! Well organized, you will see the actual ships, including the name of the NAVY personal who lost their life for their country. You can spend all day here and still not get to everything. Very informative and interesting. Watch the video and then go on the ferry to the actual memorial site. The Punchbowl National Cemetery on this tour was amazing. The visit to the Arizona Memorial and the rest of Pearl Harbor was organized, efficient, and inspirational. The whole area is beautiful, well laid out and very enjoyable.